Wanna Buy an Affiliate Network? Better hurry, only 4 hours left although there don't seem to be any bidders yet. Although the network is currently a free network, meaning it costs a merchant nothing to become an advertiser , NetTraction has already monetized the network by upselling to the merchant base. Therefore, any revenue already generated from the network was NetTraction revenue and not AffiliateTraction.NET revenue. This is why we cannot show past revenue numbers in this listing. HOWEVER, for future revenue opportunities please see below. I'm curious what the full asking price is, since the opening bid is $24,999.00 and there is a reserve on top of that. 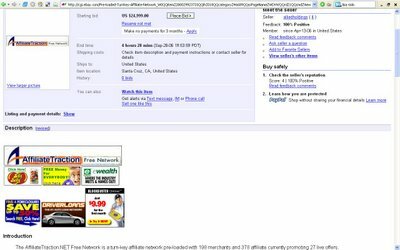 Basically it seems that you are buying their DirectTrack network license along with some merchant and affiliate contact info.